Do dragons like any kind of gold or does it have to be in coin/jewelry form? Are there any that take over a fresh gold mine and live inside it guarding all the gold in the walls? What would happen if a dragon got ahold of the goose that layed the golden egg? Must be a herbivorous dragon with a big molar like that. Dragons are omnivores, they could easily have teeth like that in the back. Hehe I did not know dragons were omnis. I always assumed with their stereotypical lust for princesses etc. that they were straight-up carnivores. Apparently, I am showing my dragon ignorance. Never pondered the Goose idea, but what I understood about European dragons is that any gold would attract them. Coins and jewelry would come from snatching caravans and raiding castles. Or, like Smaug, taking over a mountain with a fairly large hoard to start with. I guess we’ll get to see lots of dragons in space, since gold is used as a protective coating for many satellites! 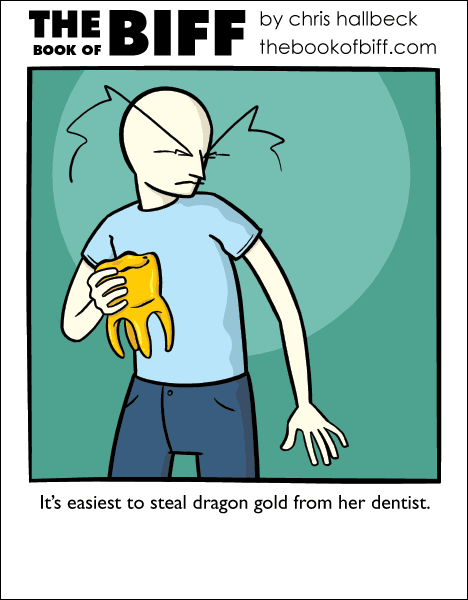 You may think it’s stealing, but everyone knows that dragon dentists are generally less inclined to keep something that’s been in a dragon’s mouth for extended periods of time. I mean… The dragon -did- go to the dentist for a reason after all. I don’t know what the dragon would do with the goose, but as for me? I think that gold still in the ground is not as nice to roll about on as piles of gold coins.